Info Megyn Kelly is the host of the Fox News program The Kelly File, the second highest rated cable news program as of mid-2015. Kelly was born on 11/18/1970. Prior to becoming an investigative journalist, Kelly earned a B.A. in Political Science from Syracuse University. She then a J.D. from Albany Law School, where she edited the Albany Law Review and graduated with honors. She worked as a corporate attorney for nine years, first with the firm Jones Day and then with Bickel & Brewer LLP in Chicago. Kelly's entry into investigative journalism began when she was hired as a reporter for WJLA-TV (ABC 7) in Washington DC. Her leading stories were coverage of the 2004 election and the Washington sniper case. Other stories covered by Kelly included the confirmation hearings of Samuel Alito, John Roberts, Sonia Sotomayor, and Elena Kagan. 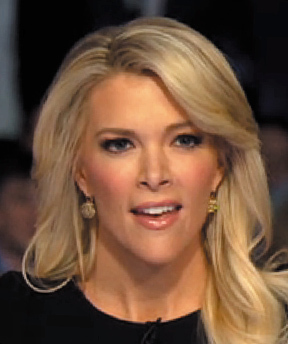 Kelly became a co-anchor of Fox News's America's Election HQ in 2012 with Bret Baier. In 2014, the Baier-Kelly team's coverage of election night was the second most watched coverage of the evening. In 2013, Kelly began to host The Kelly File, an investigative journalism show that aired during prime time. She brought her legal training to bear in both her investigations and her interviews on the show. Kelly was one of three co-anchors of the First Republican Presidential Debate of the 2015-2016 season. She drafted a set of tough questions for the candidates, but of all her questions, her request for Donald Trump to respond to his earlier characterizations about women is best known. She held her ground when Trump challenged her. Over the following days, Trump made disgusting remarks about why Kelly asked her particular question. Kelly also moderated the 7th Republican presidential primary debate in 2016.